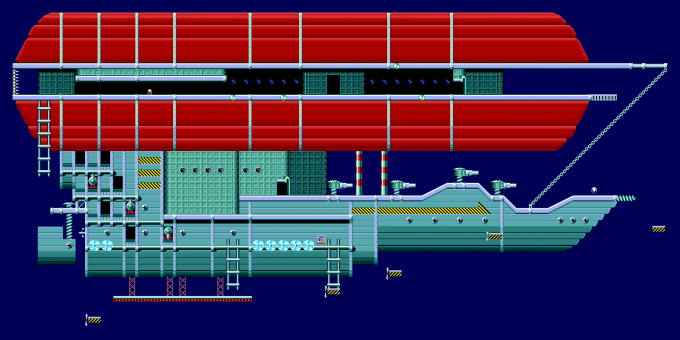 Sky Base Zone is the sixth and final zone in Sonic the Hedgehog for the Sega Master System and Game Gear. As with all other stages in the game, Sky Base consists of two platforming Acts followed by a shorter, third Act which contains the boss (and nary a single ring!). The unusual feature here is that the first two distinct Acts have completely different backgrounds and level designs. At the end of the previous level, Robotnik fled to an airship hidden in the smog clouds of Scrap Brain Zone. Sonic, obviously, pursues. Sky Base Act 1 sees the heroic hedgehog navigate his way through the exposed gantries and electric fields of the airship anchorage above Scrap Brain, speeding to catch the fat man's massive escape vessel before it departs. In Act 2, Sonic must brave the fearsome defenses on board the zeppelin itself; cannons, propeller blades, and of course the ever-present threat of falling thousands of feet to hedgehog-y oblivion. 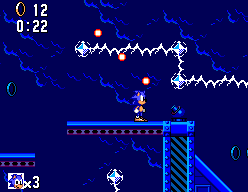 There is no Sky Base Zone in the 16-bit version of Sonic the Hedgehog, but the design of the first Act is similar to Star Light Zone in the MegaDrive game. The premise of the second Act, meanwhile, is similar to that of Wing Fortress Zone in Sonic 2 for the Mega Drive. It seems to be sort of a launching site for the big blimp. The sky is made up of electric webs, which is reused in Sonic CD's Wacky Workbench Zone. There are no rings in this stage. You can go one way and avoid bombs, spike walls and guns, or you can go around most of those by falling off the beginning platform on the left and onto a series of moving platforms and eventually to the Chaos Emerald. You run through a short passage. Once you reach Robotnik, you will notice he is encased in glass. The aim is to break the glass while avoiding the laser on the ceiling, and the ball which shoots towards Sonic (located on the ceiling). Once Robotnik's case is damaged, chase him to the end of the level. There's a warp that takes you back to Green Hill and the ending scene.